As a therapist, I’m a person who has the tender, holy privilege and responsibility of sitting with people in the darkest circumstances of their lives. I want to acknowledge the gift you have been to all of us Canadians–even the world. Your community has let us in on your grief and pain after the horrific bus accident in which so many people lost their lives and were badly injured. You have been our teachers in this messy and painful life–thank you. You didn’t sign up to teach us…I get that. In fact, this is a course no one wants to be able to schooled in. But, completely beyond your control, you found yourselves in the focus of the camera, with your reaction to the tragedy on display for the world–and you let us in. And along the way, we learned something important about suffering from you–I wanted you to know that. Your heart has been collectively ripped wide open by the raw grief of the tragedy. You could have covered your broken hearts with armour and pushed us away. Instead, you have collectively allowed the people of Canada, even the world, to tend to these tender wounds. While I trust that our care has been a gift to you, as the people of Humboldt, and indeed, all the hockey players’ families and friends, I think we can all say that being allowed into your suffering has been a gift to the rest of us. Thank you for being real with us. It’s not been easy to let us in on your pain, but you haven’t pushed us away. You welcomed the journalists–you talked to them so that you could talk to us. You even fed the media homemade soup, such is your hospitable nature, even at a time of tragedy. When you let them in, you let us in. Letting all of us in at a time of such significant tragedy couldn’t have been easy. It was brave and it was real and we admire you, even as we grieve with you. I think so often in our world, people think that allowing ourselves to be seen at moments of such great vulnerability will be embarrassing or shameful. What they don’t realize is that it just makes you real. And what is real is beautiful. You have allowed your small town Saskatchewan beauty to shine through as you have allowed the rest of the nation to sit with you. Thank you for opening the doors to your town, and opening up your broken hearts to the rest of us. When one of us hurts, we all hurt. And we do better, together. It’s been a gift to see the pastor, Sean Brandow address the community, acknowledging his despair and his pain. While he certainly had words of hope and comfort, he proclaimed how he felt lost, and felt plunged into darkness. Even as he inspired others with faith-fuelled hope, he modelled how to be open about the painful, lonely feelings of shock and grief. When he said, “I’ve never felt so empty in my life”, that felt honest. Just brutally honest. Expect it to re-emerge at times over the years to come–and ask for support then too. For Sheldon Kennedy to do and say all that–he has to be reminded of his own trauma. I don’t take his willingness to do lightly. I suspect remembering his own bus accident as the interviews he did required would have meant him having to face feelings that weren’t easy. Thanks, Sheldon, for being willing to pay that price. It’s been a gift to watch the Humboldt community both accept support from others and share support with each other. You are folks who understand the value of community. Maybe being a one-arena town does that. Thank you for feeding and hugging each other. You’ve shown us how to be there for each other. I live in a home that, on a much smaller scale, also has had tragedy. I am married to a man who lost his wife, Car to breast cancer. His boys lost their mom, long before they were ready to be without a mom. My boys lost an intact family when their dad moved out and continued his life without the community of which we had all been a part. It’s hard for boys to grieve and to talk about loss. Any boys. All young men. In a world that too often shames people for crying, it has been a gift to watch strong and brave men in your town weep. I love how the leaders of Humboldt acknowledged the loss with quavering chins, a quiver in their voice, and stopping for a moment when emotion overwhelmed. It was good for the young men in my life to witness how men show up with their sadness. Thank you for letting it be OK that you are not OK. 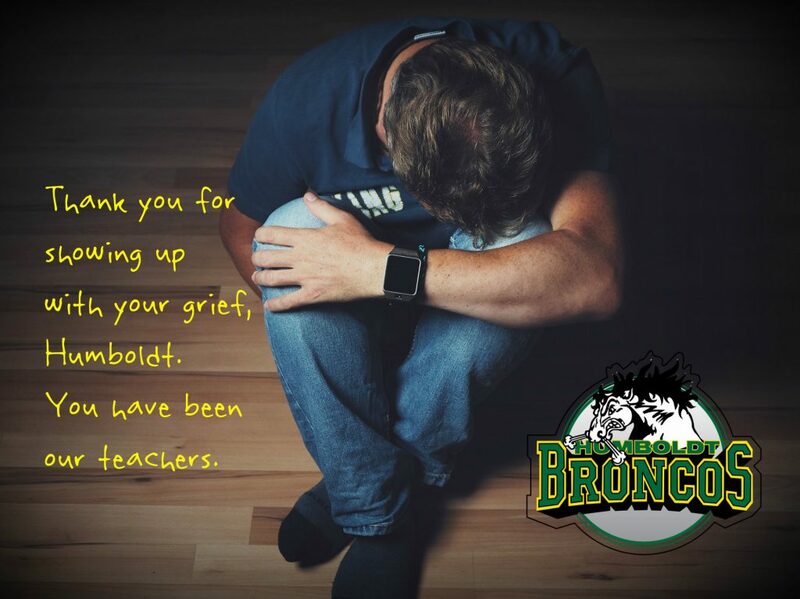 Thanks, Humboldt, for your stated commitment to be there for the kids who went to school with the hockey players and now grieve. Thank you for the way you have said you will hold open space for the loss of the billet siblings. And I am grateful to the SJHL that is making counselling possible for years into the future. Your actions unapologetically say: “It is normal for anybody to struggle after tragedy, even if you are a strong athlete”. A few weeks ago, I saw this TED talk…and we sat down, together as a family with my youngest Junior Tribe Member to watch it. I liked how psychologist Susan David, whose father died when she was a young girl, was able to teach us about the importance of feeling our feelings. Susan appealed to our heads with her knowledge. You had us experience “the gift and power of emotional courage” with our hearts. Thank you for that. 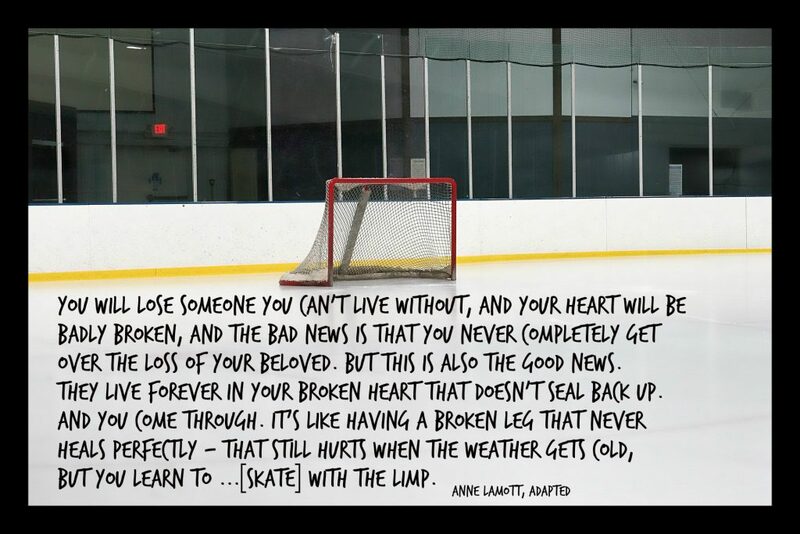 People of Humboldt…you have given us a living, breathing example of how to feel painful feelings without apology. You have received help with gratitude and have shown us how to accept support. So many of us are better at giving support and struggle to accept it, and you provided such a gracious example of how to do it. Thank you for reminding us that you will be hurting for a long time, and that healing has not yet even really begun. It gives us permission to continue to struggle in our loss, too. So many of us, around the world, have had death and painful loss in our families. Your grief has touched deep inside to our own experiences of death and painful loss. Your willingness to embrace your grief has given us permission to again grieve our own losses. We know that your grief will go on, forever. You will be changed by this tragedy. But I trust that eventually, there will be some healing in your sadness. Not healing to remove the pain, but for a way for you to live with it as a part of you. May you be comforted to know that so many who grieve with you are on the same path. It’s not easy, but we walk with you. PS. Additional Note on September 13, 2018. You had your season opener yesterday…and you invited the nation to watch. It musta been a decision to let us in and we thank you for it. We heard your gratitude about how we were there for you…thanx for letting us be a part of your story. We felt a longing to do something…and you let us…and then yesterday expressed your gratitude. We are glad that our efforts to comfort meant something to you. Thank you for this! So completely true. You have a gift with words that is appreciated and needed. As a hockey mom and a former billet mom, I felt pain and loss for them. Being able to relate and my thoughts of “it could have been us…”. Tytan and I were together when we got the news…then texts came in…the hockey world is a close knit community…there were connections. It hurt. We talked and shared and even cried together. We hoped for answers and looked for a reason…but all that came was more bad news and sadness…but then came glimpses of humanity and love and light. You captured it so well…we were allowed to share in a community’s loss but also in their hope. Thank you for expressing all of it so completely well! Thanx Taunja…it touched so many of us, but in unique ways. Thanx for sharing what it was like for you and Tytan.